Rent The Fields of Blackberry Cove, LLC | Corporate Events | Wedding Locations, Event Spaces and Party Venues. The Fields, on 21 rolling acres, awaits you at the end of Reems Creek Valley. We are minutes from Vance Birth Place, the Blue Ridge Parkway, and downtown Asheville, NC.​ The Barn is a 3,200 square foot converted stable, a unique rustic barn with the elegance of 21 chandeliers. The Barn is the perfect setting for a relaxing and comfortable celebration, whether it’s a cookout, dance, or a formal dinner. ﻿ The Lodge is a 5,000 square foot Conference Center. The Great room has 20 foot vaulted ceilings. The Boardroom will seat 14 people at a conference table. There are 2 additional dressing rooms upstairs. The largest of the dressing rooms is known as the Brides Room, providing a relaxing and calming feel, with large vaulted ceilings, and views of the mountains. The fields allow couples to have a beautiful outdoor wedding with the Appalachian Mountains as the backdrop. Ceremonies take place underneath a tall, 200-year-old oak tree with friends and loved ones gathered around. The Lodge is a 5,000-square-foot venue with 20-foot vaulted ceilings. The guest capacity depends on the number of break out rooms used. The number ranges from 60 people to about 120. The upstairs contains two dressing rooms, one called the Brides Room with vaulted ceilings and views of the mountains. The intent is to give brides a relaxing, calming place to get ready before the big event. The Barn is a converted stable with 3,200 square feet. 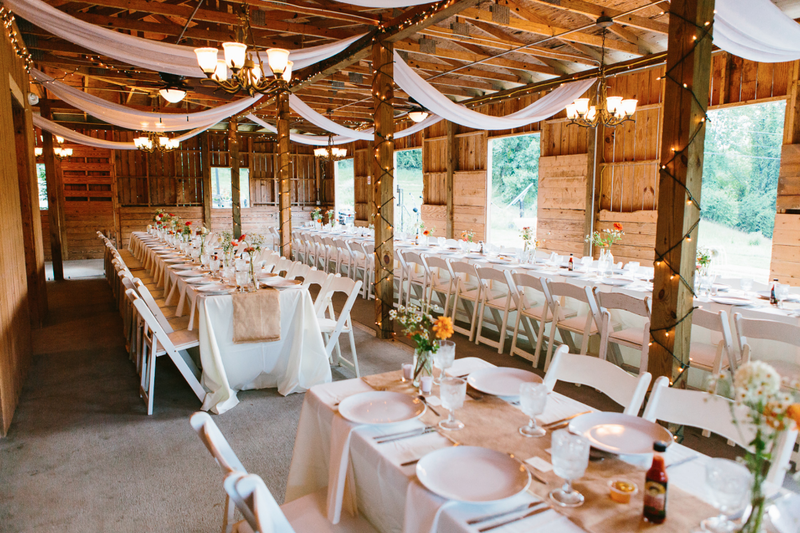 The building has the rustic feeling of a country barn, but 21 chandeliers add a touch of charm and sophistication to the space, making it a great choice for a reception.